Worried that your 4X4 lacks off-road credibility as you mount kerbs and flatten speed bumps in the city? A firm from Shropshire reckons to have found the answer - spray-on mud. Instead of heading for the nearest field and churning up beauty spots, drivers can pay a few pounds for a bottle of real, diluted Shropshire mud. A quick squirt and gleaming "Chelsea tractors" can be transformed into round-the-world voyagers more at home on the High Veldt than the High Street. Unsurprisingly, London is the main market for Sprayonmud, though the firm behind the idea said that it has had interest from around the world. According to the company's website, the plastic bottle is "just the right size for hiding in a green Wellington boot". "Keep it in your garage, in the boot, or anywhere you like. Just be careful the neighbours don't catch you using it! And remember, you've been visiting friends in the country!" There have been reports, however, that many drivers are buying the mud to cover up their number plates and avoid being photographed by speed cameras. "Sprayonmud is NOT to be used to obscure number-plates or the lights on your vehicle," the company said. "This, of course, is illegal and while it is not an endorsable offence, if your number plates cannot be read at a reasonable distance, or photographed by a speed camera, you could face a hefty fine." 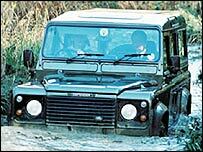 Drivers of large 4X4 vehicles have been coming under increasing attack in cities such as London. Environmentalists have slated them as gas-guzzling polluters, while safety groups have said they are a hazard to other motorists, cyclists and pedestrians. There have been calls for 4X4s to pay more road tax, and a report on Monday said that those coming into London should pay double the congestion charge. Driver groups have hit back, complaining that they are unfairly blamed for traffic problems, and argue that they are often used to carry a larger number of people. Range Rover: Beauty or beast?